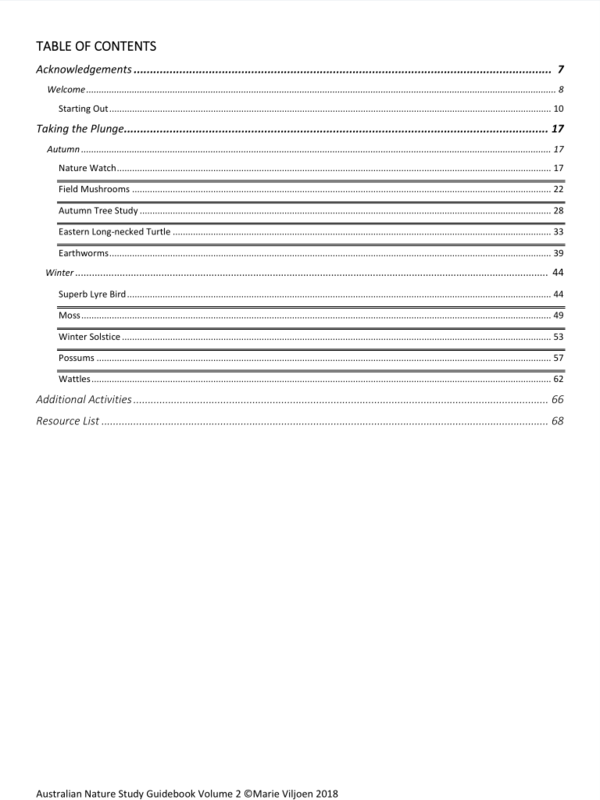 We’ll start with the contents page. As you’ll notice there are ten lessons in the guide. One for each week of the school term. There are five nature study lessons each for autumn and winter. 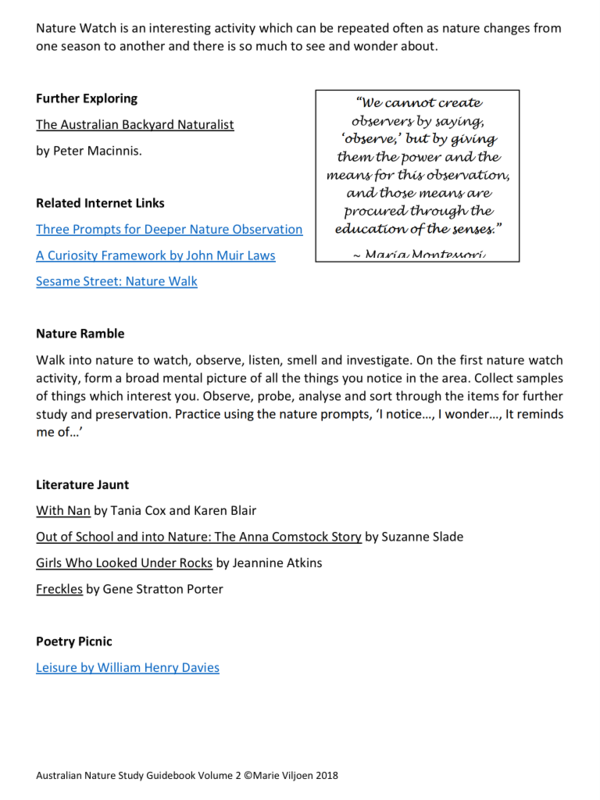 Let’s look at the first lesson, Nature Watch, in the Australian Nature Study Guide Vol 2 together. 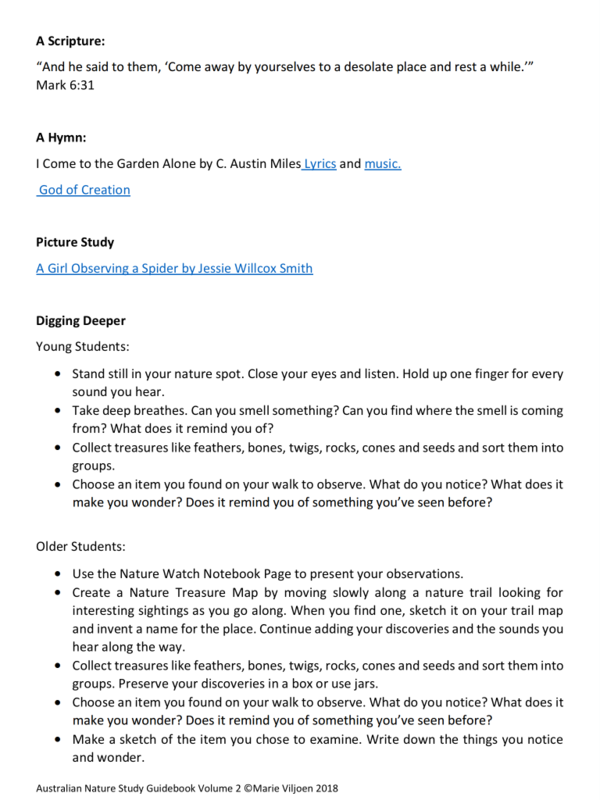 I’ve added images of the lesson so you’re able to decide at a glance whether this would be something to encourage nature study in your home or not. This section will provide information on the topic being researched before you head out doors, so that you are armed with the knowledge you need to answer questions when they’re fired at you. It is by no means exhaustive. Instead of reinventing the wheel, I’ll be referring you to helpful resources or links on the weeks topic if you’d like to research it further and dig deeper. I’ve used The Wonderland of Nature by Nuri Mass and the Exploring Creation series by Fulbright (Apologia) as references. If you do not have these resources in your home this study is not dependent on it. As I’ve included links which will take you to online resources. Please explore the guide thoroughly before purchasing any extra material to decide if it’s absolutely necessary. 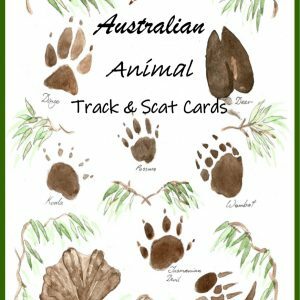 A nature ramble can be a five-minute hunt in the backyard or an hour of exploration in the bush. If for some reason you’re not able to wander outside, you can still study nature inside, whether it’s in a reference book, the Daddy Long Legs in the corner or the ants in the sugar bowl. 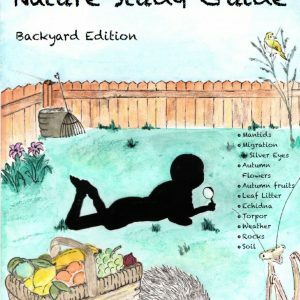 If a five-minute spontaneous, backyard ramble is what you prefer, then continue doing what’s working for you and glean what you need from this guide. However, if you have a personality like mine, and prefer nature walks a little more structured, this section will help you focus on a topic to observe. Search for a place you can visit regularly and make it your favourite go-to spot for nature walks. I’ve included a list of children’s books from the library relevant to the theme of the week which will offer enjoyment and ignite excitement in the subject to be explored. I’ve included a poem to read with the children. Due to copywrite laws, I’ve not included the poems in the guide, but most of them can be found with an internet search. The poems can be used as copy work, either as handwriting practice or as an addition to their nature journal entry. It can also be used for dictation and memory work. Picture study is a fun way to include art appreciation into your schedule. Children are exposed to wonderful works of art. The artworks can be found by using the internet in a quick search. I’ve included a scripture from the Bible and I’ve linked to a hymn for those who’d like to include these in their study of nature. In this section you’ll find activities that will help the children to dig deeper into the nature study should they choose to. 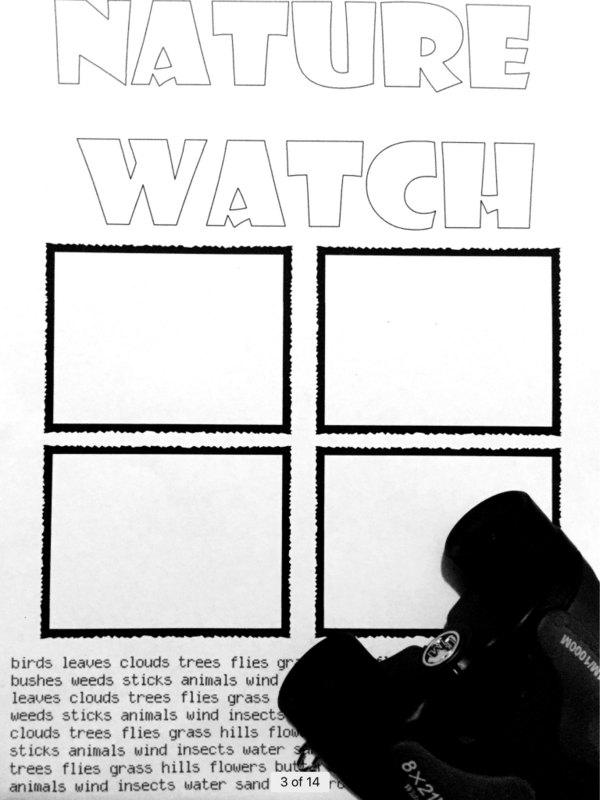 There are activities for research, science, crafts, writing, building projects and much more. Allow the children to choose an activity that’s most appealing to them, unless you’d like to take a unit study approach and work on these assignments over a few weeks. I’ve included assignments to be enjoyed by a variety of ages. As families, we know it’s important to enjoy the outdoors together, and as busy people, we can save time by integrating all ages into one study. Read: first you’ll gain knowledge on the topic focused on for the week. You can choose to share it with your children or share the information as they ask questions. Explore: you have the option of exploring the topic further by accessing internet and YouTube links. Walk: then you’ll enjoy a nature ramble in your favourite nature spot. 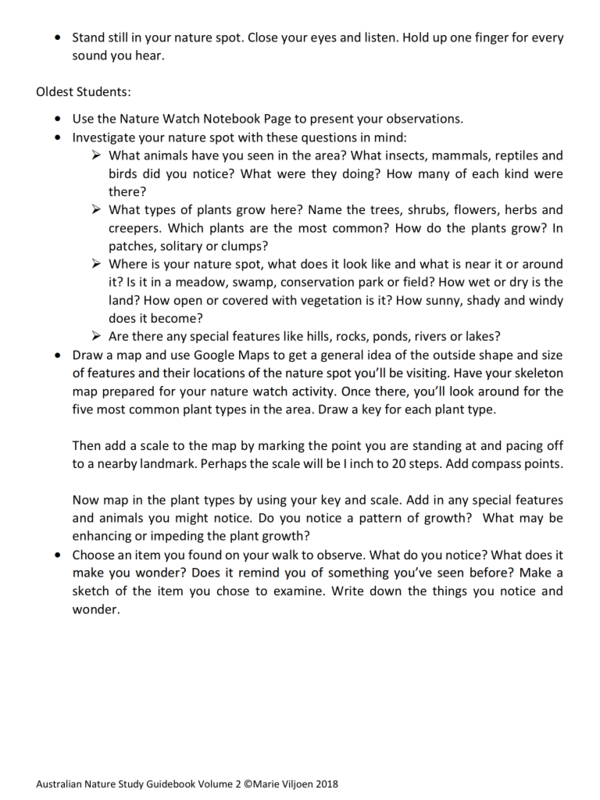 Journal: you’re encouraged to record your observations from the nature ramble into nature journals. Read: a list of living books related to the topic is listed for your convenience. This is also a great opportunity to share the poem, scripture and hymn with the children. Study: a piece of art is suggested for observation. 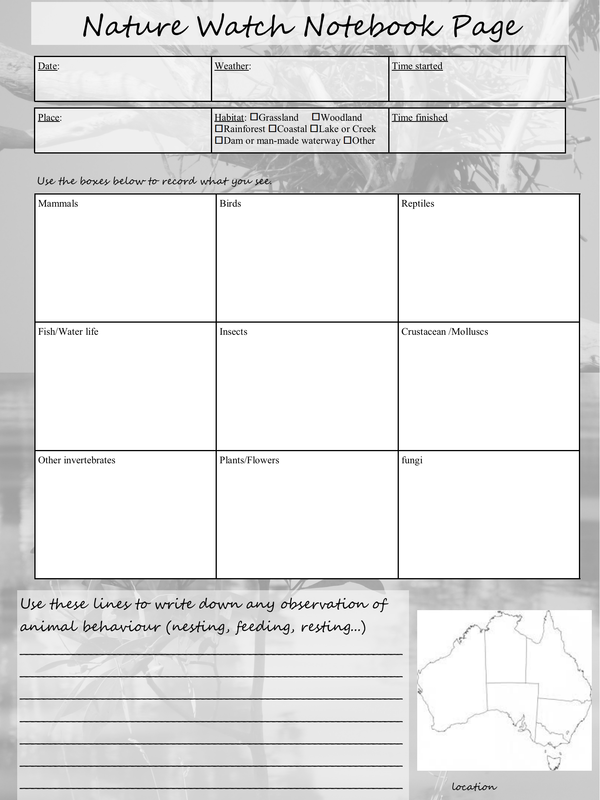 Dig Deeper: you’ll find ideas of activities for multi aged students if they wish to dig deeper into the subject. Should you have any questions, pop them in the comment box below and I’ll be happy to answer them for you. Included in the guide are notebook pages for each lesson for children who are in Kinda and older children in primary and highschool (15yrs). 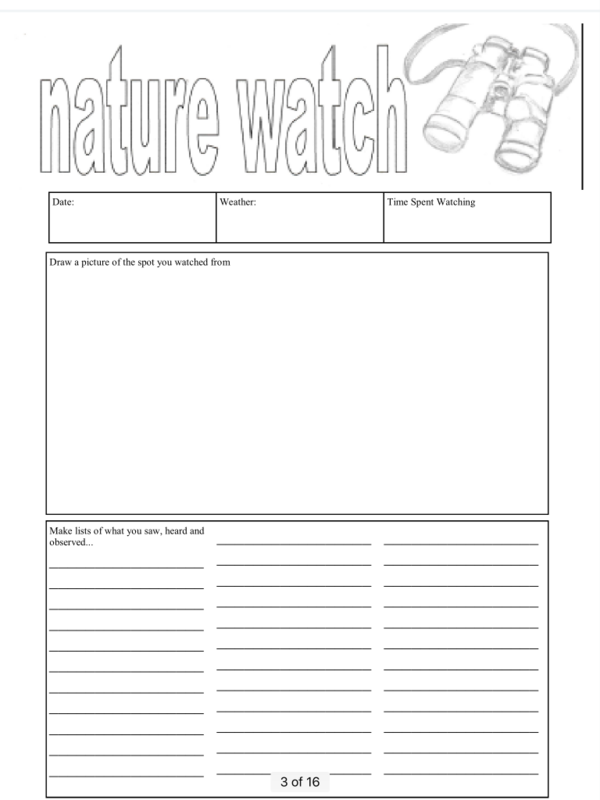 If you’d like to know more about the nature guides, please visit our About page. 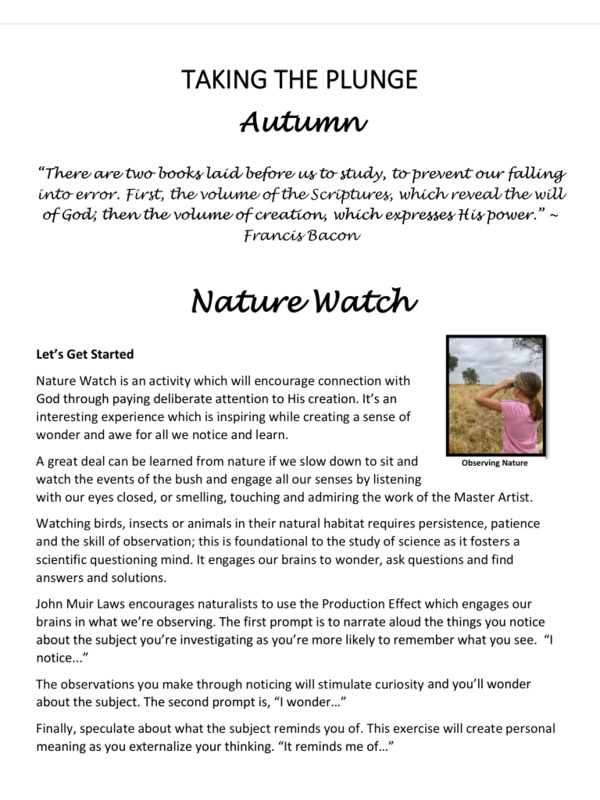 The Autumn / Winter Nature Guide is available now. 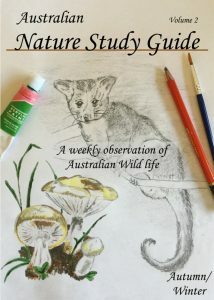 Download the Nature Study Guide Vol 2 Free Lesson to give it a go.